Ghirahim: Well, you'll need to learn now. -he narrows his eyes slightly- I can tell. However, you need to come with me to the kitchen. "When you live on the streets, a lot of things aren't all that worth learning." Bakura got up. "Spoil sport." Ghirahim: -he goes over to where the food is stored and motions for him to come over- Obviously the first step to learning ho to cook is getting the food. "Yeah but..." He shook his head. "I know very little about food except for prey. I know the difference between stalking a mouse and stalking a rabbit. I know to stay downwind of what I'm stalking. I know the right moment to pounce. Everything else..." He shrugged. Ghirahim: Well, I will teach you what food I keep stocked in here. "Okay. Don't get upset if I make mistakes though." Ghirahim: If you do and wind up wasting food, you know how to hunt. You'd fetch what we'd lose. Anyway... In here, I have beef, chicken, rabbit, and various kinds of fish so far as meats go. As for fruits and vegetables, I have quite the variety. I'll teach you the basics of cooking, but it's up to you to get better. I will occasionally hold judging of how well you cook, and I will tell you a few of the things you will need to improve. "Sure. Just teach me how to hunt these...veggie table things..."
Ghirahim: Vegetables aren't hunted, they are grown. Vegetables and fruits are plants, and growing them is the only way to get them. I have a magnificent garden out back. "Well sor-ry! You expect me to know everything?" He shook his head. "Anyway I only know how to hunt rabbit. The other two you mentioned..." He shrugged." Ghirahim: I obviously don't, you being who you are, but it would've been better if you did. -he looks back at him- Beef is simple enough. Cows, where beef comes from, are raised and then killed, and killing them can be difficult due to their size. To be swift and quick, do away with the head. The same thing goes for chickens, but the ones here... If you don't end the life quick enough and away from others, they'll gang up and all attack you at once. As for fish, you usually take a rod with a string, hook, and bait, cast it into a pish-filled lake, pond, or river and then wait. When you get a bite on the hook, you real in the fish and put it into a bucket with ice. However, bears and other creatures simply stand in a river at a flow they can still stay standing in, and when the chance arrives, they take their massive paws and swipe them up and out of the water. "Wait I know how to fish. I just hate getting wet. That and I prefer shallow water." Bakura's ears twitched. "Never seen a cow before. They don't live in the city, at least I don't think they do." Ghirahim: Well, it'll be in your best interest to learn how to get over those pesky fears of yours. -he shakes his head- They usually don't. There are wild cows here, and there's even some owned and raised by other intelligent species here on the surface. "It's not my fault. If you want to blame someone for my fear of deep water, blame the mad scientist that damn well nearly drowned me on purpose when I was a kitten." Ghirahim: I see... Well, I'm sure with enough practice you can get over your fear. "You never get over traumatizing things like that..."
Ghirahim: Well, at least there's shallow water fish. "Yes. Thank you Captain Obvious." Bakura flicked his tail. 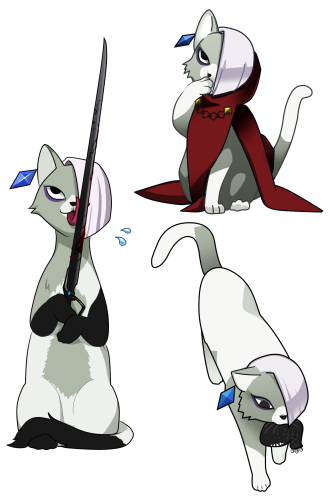 Ghirahim: -he gives him a sharp look- Watch your mouth. Now, come here. Bakura went over to him, the tip of his tail twitching like a metronome. He was irritated, close to being pushed to running away. But he tried not to show it.